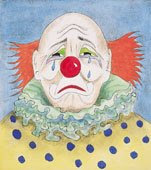 I have my sad face on today because I must take a short leave of absence from my blog! We will be taking a planned holiday in our motorhome ( yes-I KNOW-I'm back to a caravan again) for about a week and a half. Normally this is a pleasurable thing we do at this time of the year to find some sunshine, but it will be a wrench not being able to easily connect to the internet as we shall be touring around. However I will have a camera at the ready for some picture stories on my return. Take care in the meantime, and happy blogging! See you soon!